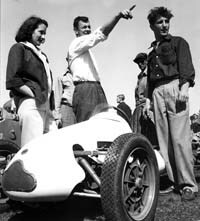 Joe Breeze, son of Bill Breeze, early 1950s Northern California racer and Regional Executive of the San Francisco region of the SCCA, contributed his photos & memories. Click on image to see larger image and more info. 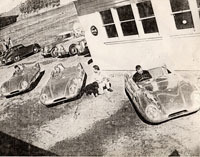 "Bill Breeze's Sports Car Center stood at the edge of Richardson Bay in Sausalito..." Bill Breeze in #4 Jaguar XK-120 and Phil Hill in #2 Jaguar XK-120 at Pebble Beach, 1950. 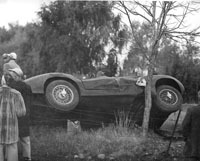 Bill Breeze's Jaguar after crash at Reno SCCA event, 1951. 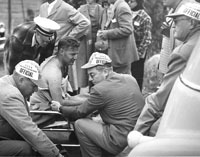 Bill Breeze after sustaining shoulder injury in accident at Reno SCCA event, 1951. 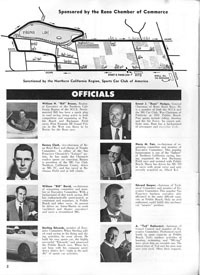 Program page from 1951 Reno race. 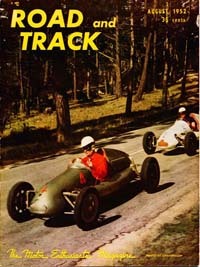 "Cover of Road & Track, August, 1952. 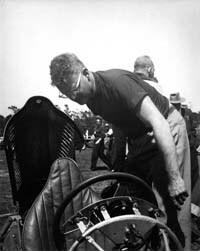 Russ Kelly leads Bill Breeze, both in Cooper 500 Formula III Grand Prix cars at Pebble Beach. " 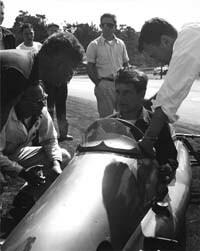 "My mom said dad thought highly of Alfa's DOHC design." 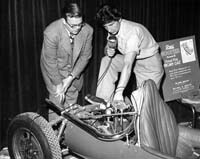 "Russ Kelly (with mic) pitches the attributes of his new ride..." "Joe Esherick with teammate Russ Kelly at Pebble Beach in 1952..."
"Bill Breeze, Russ Kelly and Joe Esherick at Pebble Beach in 1952" "Bill Breeze gives one of his two Cooper FIII cars a final check..."